Join GirlVentures for the Rising Together Course! This course is designed specifically for Female, Transgender and Gender Nonconforming youth of color in 9th, 10th, 11th and 12th grades. The group will engage in a 5-day camping, rock climbing and hiking expedition in Pinnacles National Park. The course is specifically intended for youth of color to safely and collectively experience the healing capacity of the outdoors. Participants will cultivate rock climbing skills and explore the caves and cliffs of Pinnacles. Students explore concepts such as trust, social justice, identity, and leadership through activities designed for their age group. 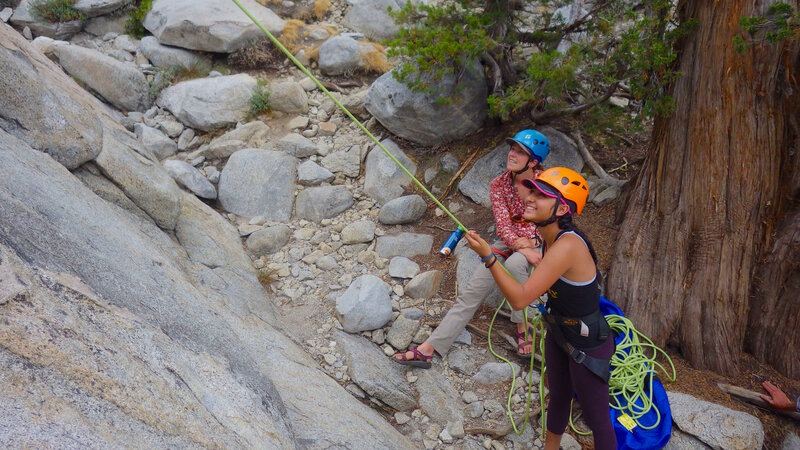 Climbing provides the format and structure through which young people can develop the physical, emotional, and social tools that help them be successful on this course and also with their families, schools and other groups. Youth will sleep in 4 person tents each night, and take turns cooking nutritious meals for each other. All this while learning the importance of Leave No Trace Ethics, and the connection between the natural world and people. Students will take on different leadership roles each day and guide the daily activities for their peers, with instructor support. This event is hosted by GirlVentures, a member organization of Alliance for Girls.